Housed in tip-on style heavy jacket. Includes an insert with liner notes. Reissue on heavyweight vinyl. 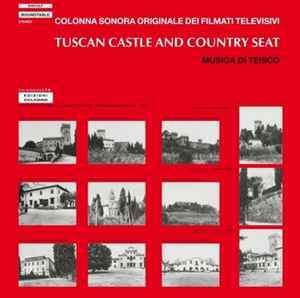 Original released as Teisco - Tuscan Castle And Country Seat (Colonna Sonora Originale Dei Filmati Televisivi) in 1978. Absorbing album of music recorded to accompany a 1978 documentary film about Tuscany. White Gladiator is probably the best track with its melodic organ, sheets of white noise synth* and jerky, almost garage band backing. Most unexpected from a bucolic soundtrack. The epic Old Colours meanders with descending and ascending piano and some very subtle and distant washes of synth. You can almost expect Satie to have conjured this one, if he was still with us. How I enjoy the understated use of synth* on this album. Another reference point may be John Cale - the piano makes me think of his Academy In Peril album. If Cale made an album like this it would be the best thing he ever did - outside the VU. That's just side 1. Side 2 is maybe a notch down but still great. More garage band strumming, clanky rhythms, keyboard magic and more very inventive ideas. For people who like library/soundtracks or lo-fi rokc like the VU this album's an absolute must. Not the greatest pressing I've ever heard with numerous clicks and pops, especially in the quieter moments. New vinyl is such s*** these days. Somehow the quality of the music manages to transend the poor pressing. * I see Moog isn't credited on the album - maybe it's an electric organ.